The Boardwalk on Okaloosa Island is like the Swiss Army Knife of tourist destinations. Whether you feel like shopping, eating, or enjoying a night out … the Boardwalk has it all in one convenient location. 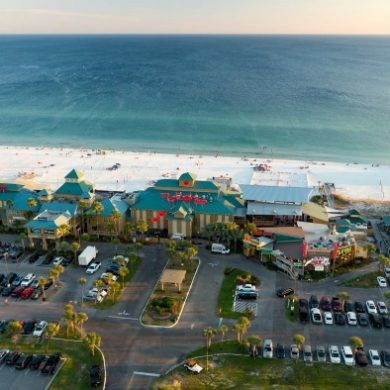 Nestled on the coast of Okaloosa Island and overlooking the emerald green Gulf of Mexico, the Boardwalk takes the guesswork out of your daily plans while on vacation. Not in the mood for tacos? Al’s Beach Club & Burger Bar has the griddle cranked up and is churning out high-quality burgers seared to perfection. The menu at Al’s is simple – burgers and cheeseburgers. And since you’re on vacation, try washing down your meal with one of Al’s Hand-Spun Milkshakes, made daily with all-natural ingredients. Classic vanilla and strawberry are always delicious, but don’t be afraid to embrace the local spirit and try one of the Signature Key Lime Pie Milkshakes. Al’s also has live music every night until late, so don’t forget to come back after hours if you feel like dancing. After you’re done chowing down, saunter over to Islanders Coastal Outfitter. Since 1980, the shop has been delivering excellent customer service to locals and tourists alike. Forget about the kitsch, because Islanders Coastal Outfitter carries all of the premium coastal and beach brands. Gear up with a new pair of board shorts or a rad pair of shades for your next beach day. The Boardwalk also plays host to one of the most spectacular firework displays on the Gulf Coast. If you and your group are visiting between Memorial Day and Labor Day, be sure to catch a glimpse of the fireworks every Wednesday at 9 p.m.
Ditch the rental car and stay for the day at the Boardwalk on Okaloosa Island. The Boardwalk is located at 1450 Miracle Strip Parkway in Fort Walton Beach FL. For more information, visit the website.